TJ hails from New Jersey. Those who know him best would say that the Jersey in him makes for some of the most appealing aspects of his character, including a powerhouse work ethic and an ability to relate effortlessly to people from all walks of life. A lifelong athlete who took time to grow into his large physical frame and excel at sports, TJ has always had a foot in the fitness realm. After college, he taught PE at a school in his hometown. While he liked the job, he decided there was more to explore; he moved west, landing in Marin County in 1992. After many years as a personal trainer, TJ opened his own gym in San Rafael in 2002, shortly before the birth of his first daughter. At that time, it was a place where he and other personal trainers could work with clients without the hassles of larger, less personal facilities. While TJ loved his work as a personal trainer, by 2007 he found himself itching to expand his knowledge and recharge his training batteries. This happened when he found CrossFit, an exercise program involving functional body movements executed at high intensity and with great variety. TJ took to CrossFit immediately, immersing himself in the science and theory of the program while introducing his clients to their application. TJ, himself, began training with the CrossFit program and quickly saw and felt results that he had never experienced in all of his years of exercising. He shed body fat, increased his strength, lowered his running times, and, perhaps most importantly, got rid of chronic knee problems and high cholesterol levels. TJ combined CrossFit with aspects of other strength-and-conditioning and nutrition programs he holds dear, a holistic approach he still uses today and one that is manfested in all of TJ's Gyms. Like that of many small business owners, TJ’s success can be attributed to a number of factors. However, those closest to him emphasize the same interpersonal qualities that allowed him to retain his first clients over 25 years ago. Although TJ holds certifications in various aspects of fitness training, he finds that it is his independent learning that has been most applicable to the success of his gyms. A driven researcher, TJ's goal is to constantly delve into smart science behind fitness, health, medicine, nutrition, psychology, in order to adapt and innovate for the benefit of his members. His passion is helping people set goals, stay accountable, and lead better lives. He meets individually with everyone who walks through the doors of the gyms, a practice reflecting his deep desire to connect with each of his members and help them succeed in their fitness and lifestyle goals. TJ feels fortunate to mentor and work with other fitness professionals who love their jobs and bring their own personalities and interests to his gym. He is most proud of the amazing community of people he and Allison have been fortunate enough to bring together at TJ’s Gym. While life is sometimes stressful and always very busy, TJ is inspired by the athletes in his classes, her personal coaching clients, and the daily opportunities he has to help people live longer, more fulfilling lives. Allison does much of her work behind the scenes running the operations at TJ's Gym. In addition to managing the business and coaching classes, Allison is a licensed psychologist with an academic support practice in Marin, a published author, a blogger, a consultant, and a mom to two teen girls. She wrote the first book about CrossFit, titled The Power of Community: CrossFit and the Force of Human Connection. Until recently, she wrote a blog called Psychologywod.com, covering the mental and psychological aspects of fitness and sport training, as well as life outside the gym and off the field. Allison also helps run her younger daughter's fundraiser, Juggling for Jude, which is a great example of making a difference through sport. Juggling for Jude involves a young soccer juggler using her talent and determination to raise money for the renowned St. Jude Children's Research Hospital. Allison has worked with youth sports teams to optimize performance and enhance relationships among team members, and she also speaks to coaches, athletic directors, and parents about psychological and relational aspects of working with young athletes. She has also worked as the pyschologist consultant in the development of a mindfulness app for athletes. Life is hectic and frenzied at times, and Allison relies partly on her workouts at TJ's Gym to keep her sane. She has a long history of involvement in athletics, as both a player and a coach. Allison played soccer at the Division I level in college and has since coached a number of youth soccer teams in the Bay Area. A former wilderness backpacker and long-distance runner with five marathons completed, Allison knows what it means to focus on a fitness goal and achieve it. Allison is known for her ability to inspire other athletes when they are struggling, and she often finds herself wearing her psychologist hat when working with gym members. Allison has a Bachelor’s Degree from Dartmouth College, a Master’s Degree in Learning Disabilities from Northwestern University, and a Doctoral Degree in Clinical Psychology from The Wright Institute in Berkeley. For more about her academic support / tutoring practice, please visit her website. Alex spent his early childhood in New York and moved to Santa Cruz when he was 12. He returned east for college, where he rowed crew and played lacrosse. Alex graduated from college with a degree in Sustainability; his senior thesis focused on the sociology of our food choices. Alex has been a firefighter for Cal Fire since 2008. He first tried CrossFit in 2012, because he was tired of doing the same routine at his gym, along with running every day. After earning his CrossFit Level One training in October of 2017, he completed a strenuous internship at San Francisco CrossFit, where he honed his coaching skills. He is currently the physical fitness coordinator for his firefighter division and has revamped the program with an emphasis on mobility and nutrition. Outside of the gym and work, Alex enjoys mountain biking, fly fishing, and paddle boarding with his wife, Liz. Anthony comes to us from the great state of New Mexico and is the youngest of five siblings. He has always been active in competitive sports, and he credits this background for enriching his relationships, character traits, and life lessons. A standout athlete throughout high school, Anthony garnered a variety of sports accolades, including: State Champion discus and shot put thrower, State Champion 4x200m relay, member of the All-State Basketball Team and All-State Football Team at four positions. Anthony attended Occidental College on a football scholarship, where he received his Bachelor of Arts in Philosophy. He continued his athletic career at Occidental as a four-year starter at the outside linebacker position, helping his Tiger Football Team rise to fourth in the country. He earned four-time Defensive Player of the Year, three-year All-American, four-year All-Conference, and two-year Team Captain honors. After college, Anthony pursued a career in professional football. However, a number of injuries ultimately lead him to call it quits. Still, he is thankful for this experience, which allows him to relate to other atheltes creating and going after their own goals. Anthony got hooked on CrossFit when he met TJ and Allison in early 2011. He loved their message: to inspire and educate people to make powerful choices that promote a healthier, happier lifestyle. As a sport, CrossFit appealed to Anthony; the variety of movements and skills involved in the sport plays to his desire to do it all. In 2012, he trained and competed with the TJ's Gym Affiliate Team, placing third at the NorCal Regionals. He also competed on the TJ's team in 2013. In addition to fitness coaching, Anthony is passionate about, and dedicated to, inspiring others to be their best in all aspects of their lives. He loves coaching and mentoring teens and is especially soughy after by teens wanting personal training. Anthony is also Co-Founder of Mammoth Bar, a Paleo bar perfect for the snacking needs of athletes, and you can find his products in all of TJ's Gyms. Chris is a Marin County native who grew up in Mill Valley. He attended high school at Marin Academy in San Rafael, where he led the soccer team to two consecutive North Coast Section titles, set a school record for scoring, and was named league MVP and athlete of the year during his senior season. His collegiate career at UC Santa Cruz was cut short by an unfortunate series of knee injuries. After college, Chris was in the process of pursuing a career in medicine when he changed course to follow his passion for health and fitness. He became a trainer for an outdoor bootcamp company in San Francisco and later created his own business involving outdoor personal training and group classes for corporate clients. Chris' introduction to CrossFit came in 2015 when he walked into San Francisco CrossFit looking for something new. He was instantly hooked and worked tirelessly to become a more well-rounded athlete. Chris is obsessed with learning new skills, and as a coach, he loves nothing more than sharing his knowledge to help others achieve their goals, both in fitness and in life in general. Outside of the gym, Chris is a self-proclaimed nerd who watches Jeopardy; completes the Sunday New York Times crossword; and spends his remaining free time cooking, eating, or thinking about food. 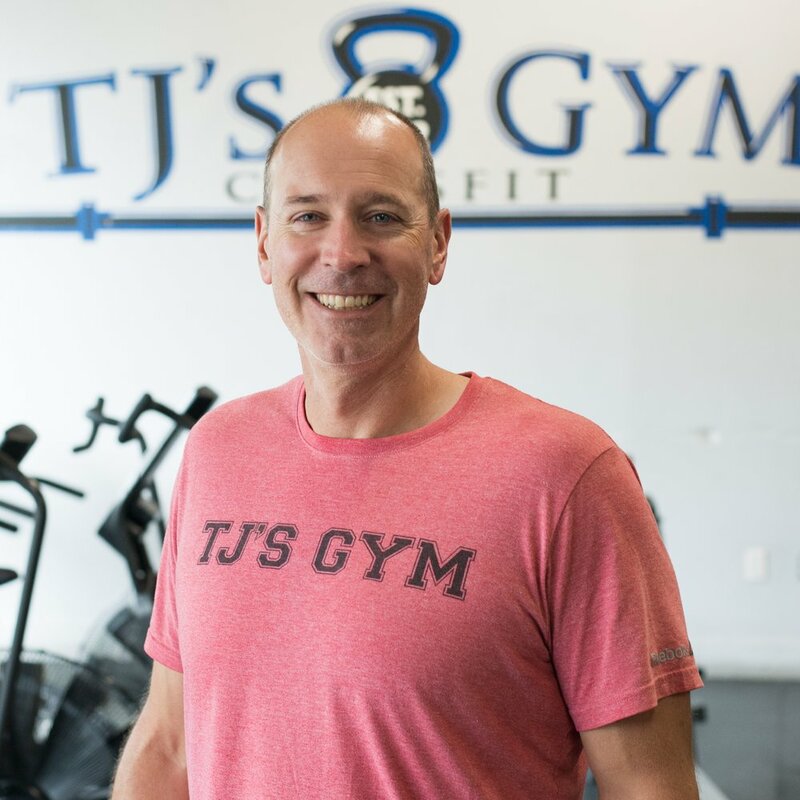 Chris is thrilled to find himself immersed in the TJ’s Gym community, along with his wife, Sondra, and he is driven to continue to address the needs of a wide variety of TJ’s members. Deirdra loves to share her passion for health and fitness with others, and she has done so for more than 30 years as a group exercise instructor, personal trainer, and club owner. For 11 years, Deirdra owned Fitness Break, a 6,000-square-foot fitness club located in San Francisco’s financial district catering to working people looking for a conveniently located fitness center. As a former figure skater, dancer, cyclist, and tennis player, Deirdra knows the commitment it takes to excel at one’s chosen endeavor. But until she discovered CrossFit, she never realized how exciting and inspirational constantly varied and functional fitness could be. She Deirdra never considered herself competitive, but CrossFit group classes and competitions brought out a competitive side she did not know she had. Deirdra is thrilled that she was able to compete and place in the 2011 CrossFit Games and 2012 Norcal Masters. She is committed to helping others reach their health and fitness potential, no matter their age or current fitness level. CrossFit Level I ACE Personal Trainer IDEA Advanced Level Personal Trainer AIFE Older Adult Fitness Trainer Schwinn & Johnny G Cycling Certified PIYO Certified AIS Activated Isolated Stretching Certified. Evan grew up in Solano County. He played baseball competitively through college and even had a stint on a semi-pro team. After discovering CrossFit as a means to satisfy both his desire for exercise and his need for a competitive outlet, he was hooked. Evan came to TJ's Gym in early 2010 when he moved to Marin County. Evan became a coach for TJ's Gym in early 2012 and has competed with the TJ's Gym team at the Crossfit Games NorCal Regional numerous times. He even met his wife, fellow TJ's coach Jessica, at the gym! They now have two young children who will be ready for TJ's Gym kids' classes in no time! Life is busy, as Evan is also a full-time middle school teacher outside of his work at TJ's Gym. The juggle is worth it to Evan, as he loves being able to improve the lives of our members through fitness, with an emphasis on solid and enthusiastic technical instruction. Gabe is a New Yorker who made the move to The Bay Area. As an athlete, he swam and ran cross country through high school and college, which seamlessly translated into his becoming a competitive triathlete soon after graduating. Gabe represented Team USA at the amateur level Olympic distance triathlon world championship in London in 2013. Gabe found CrossFit while searching for different ways to get stronger on the bike portion of that race, and the sport of CrossFit has since become Gabe's outlet for his strong competitive drive. As a coach, Gabe has more than two years of experience coaching at CrossFit Garden City, one of the largest CrossFit affiliates in the Northeast. He loves coaching and is excited to continue to work with people who are ambitiously looking to become healthier versions of themselves. Gabe's people-first mindset fits in well with the community atmosphere at TJ's Gyms, and he is technically sound and pays close attention to the mechanics of movement. In the past, Gabe worked for a health supplement company and knows his stuff when it comes to supplements and nutrition. He is more than happy to answer your questions any time! Jessica is a Marin County native who played sports and danced throughout her youth. After years in the financial service industry, Jessica made the leap to full-time Business Manager and coach at TJ's Gym a few years ago, and she hasn't looked back! With two young children at home, Jessica knows firsthand the demands of balancing a career with parenting responsibilities. Jessica's first love is working with young athletes and instilling in them a love of movement and discipline for the long haul. She also enjoys pushing adult athletes safely out of their comfort zone, allowing them to make physical changes and gain confidence in their abilities. Jessica competed at the 2010, 2011, and 2012 CrossFit Games as part of the TJ's Gym Affiliate Cup Team. Taking home sixth place worldwide in 2012 was one of the biggest thrills of her athletic career. Kristel was born and raised in Alaska and moved to Petaluma when she was 14. After graduating from high school, Kristel gradually gained 100 pounds over five years. She struggled to feel well and was finally diagnosed with Celiac Disease in 2009, which changed her life. Kristel lost 30 pounds within the first month of changing her diet, and she started exercising for the first time in her life. She was introduced to CrossFit in 2014 and found it to be the perfect match for her fitness goals, her work ethic, and her high-energy personality. Kristel has competed in the sport of CrossFit for the past two years, an outlet she loves. When not in the gyms, Kristel enjoys hiking with her husband and their four dogs. Always positive, Kristel relies on an attitude of "Eye on the prize," and she is always striving to do and learn more. She tries to instill a similar positivity in her clients and is thrilled to be able to guide others through their own fitness journies! Nick grew up in Marin County and attended Tamalpais High School. He moved on to Humboldt State University, where he graduated with a B.S. in Kinesiology with an emphasis in Exercise Science. Nick earned a collegiate scholarship, competing in Cross Country and Track and Field (800m,1500m & steeple chase). 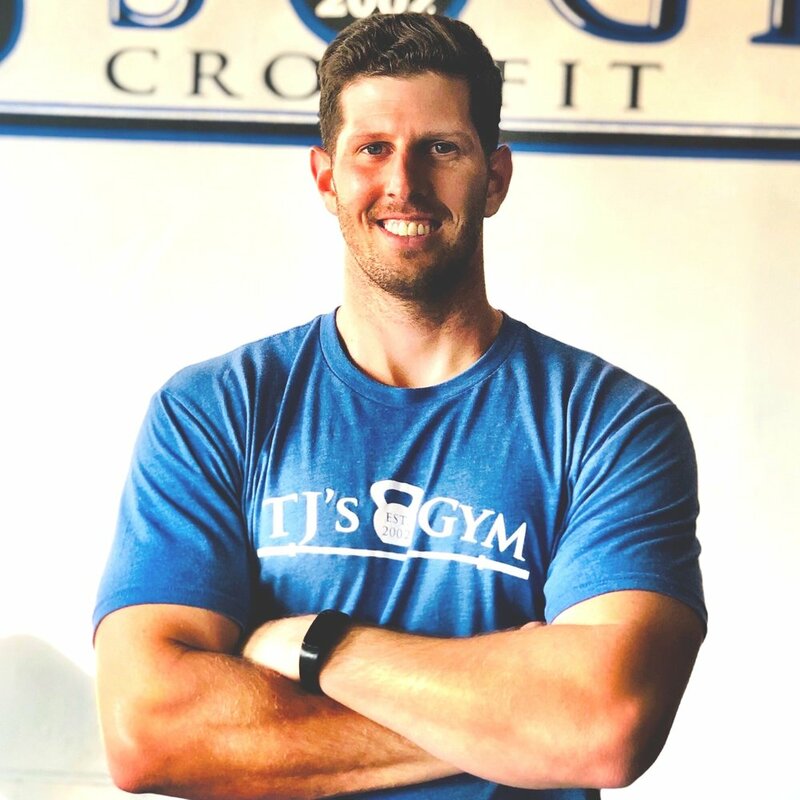 During his senior year, he completed an internship at TJ's Gym to earn hours for his undergraduate degree and was immediately drawn to CrossFit and its thoughtful implementation at TJ's Gym. Nick was especially intrigued by the mix of endurance training and strength development included in a sound CrossFit program and recognized that part of what makes it works so well is the strong community supporting positive life-changing habits--both in and out of the gym. A student of various other strength-training methodologies who is passionate about his ongoing learning and development of expertise, Nick is a sought-after asset to the TJ's coaching staff. He is known for his exceptional attention to individual members' needs, especially as they get started with a new exercise and lifestyle program. He is our Head Coach in San Rafael and also coaches our Legends program for ages 60+. In addition to coaching, Nick programs the workouts for all classes at TJ's Gym and also works with clients via our Individual Design program. He is meticulous about the process of designing workouts for groups and individuals, alike. Born and raised in San Anselmo, Nicki graduated from Drake high school, where she ran cross country and track. She later graduated from Fort Lewis college in Durango Colorado, where she made the most of the access to the great outdoors. While in Colorado, Nicki worked as a snowboard instructor, mountain bike guide and raft guide. She also competed in snowboarding events, including boarder-cross, big-air, and halfpipe competitions. After college Nicki spent six months surfing in Australia, then moved to Juneau, Alaska where she worked as a lead glacier guide for a helicopter company. In 2010, Nicki was introduced to CrossFit, and she was hooked immediately. Her experience with CrossFit at TJ's Gym has changed her life in more ways than she could have ever imagined when she first stepped through the doors. One of Nicki's favorite things about CrossFit is that, in addition to becoming stronger, faster, and more fit than ever before, she has grown emotionally and spiritually in ways that parallel her physical gains. Nicki competed on the TJ's Gym Affiliate Cup Team in 2012, which took sixth place at the international CrossFit Games. Susan walked into TJ’s Gym at the original Corte Madera location in the early Spring of 2011. She was inspired to experience CrossFit, after witnessing the total transformation of two close friends who were moms at her kids’ school. After one summer at TJ’s Gym, these moms had transformed themselves into people confidently wearing skinny jeans and backless dresses – something Susan wanted for herself badly. They also carried themselves with confidence and spoke of their newfound strength and confidence, which was even more impressive. Having attempted many different ways to “get thin” and fit through poor diets, cleanses, group exercise classes, and memberships at swanky gyms, Susan hadn’t found anything that worked, until she found TJ's Gym and CrossFit. Susan is no stranger to training, competing, and coaching. A former NCAA Division 1 volleyball player at St. Mary’s College in Moraga, CA, Susan later played for an International traveling team through her post-college years. She began her career in the fitness industry in the mid-90s as a personal trainer in San Francisco but put it on hold to pursue other endeavors, including staying at home with her young children. In CrossFit, Susan finally found her “thing.” Inspired by the physical work in the gym and the emphasis on nutrition, she dug in deep and even had her own food blog for some time. Susan has extensive knowledge about nutrition and cooking and is always good for a tip or two! Susan is thrilled to be helping members to achieve their health and fitness goals and change their lives for the better! Veronika happened upon CrossFit™ in June 2012, towards the end of her college tennis career. It was a perfect transition for her, as she was looking for something to keep her in shape and allow for a competitive outlet. Veronika has put that competitive fire to work in CrossFit™, competing on a Regionals team in 2014 and 2015 with her previous gym in Colorado, and in 2016 and 2017 with TJ's Gym. She gravitates most to gymnastics movements, given her history in the sport, and she is a great resource for TJ's Gym athletes wanting to develop their skills in this aspect of their fitness. Prior to beginning work full-time at TJ’s gym, Veronika worked full-time at Puori, a supplement company, and she has significant knowledge in the area of supplementation and nutrition. As a coach, she enjoys working with a wide range of athletes. She believes that fitness can benefit everyone and that it all starts with an excellent strength-based program. Zoe is a Marin County native who is passionate about all things fitness and health. She grew up loving athletics, playing softball and basketball at Marin Catholic ('08). Softball was her main focus, and she played competitively until her lack of strength training and overuse led to a substantial shoulder injury. She had big plans to play softball for UC Davis, but the shoulder injury ended her softball prematurely. The injury was a huge blow to her identity, and she struggled to find something to replicate the athletic community she missed so much. She loved working out and feeling fit, but daily trips to the gym quickly felt redundant and uninspiring. In 2012, a friend brought Zoe to her first CrossFit class in Davis, and she was hooked. She immediately felt the benefits of the lifestyle and community fostered by the workouts. And it was a bonus that solid nutrition and a happy life were encouraged! Her shoulder injury responded quite well to the strength training involved, and Zoe knew that she was on track for her future. Zoe landed at TJ's Gym in the summer of 2014. Soon after, she received her Level 1 CrossFit certification and began training to compete as part of the TJ's Gym team. Zoe loves that she is challenged every day, and she is continually inspired by the significant and positive changes that can happen when clients join the gym. Outside of the gym, Zoe enjoys exploring the outdoors with her dog, Tucker, and completing insane physical challenges like the GoRuck. Zoe is passionate about her current path and her goal is to help people create happiness through fitness and health. Annie comes to us from Connecticut. A D1 softball player in college, she later took up rock climbing competitively and coached in a youth league. She was injured while climbing and found CrossFit as means of recovery. Soon after starting at CrossFit, she started to compete in the sport, which naturally evolved into coaching. Eventually, she quit her full-time job, and has coached in various locations ever since. Annie's latest move has brought her to the Bay Area, and we are thrilled to have her as part of the TJ's Gym coaching family! Interested in joining the TJ’s Gym family? Learn more.